Today has been one of my, and I hope in writing this that I may speak for the whole group, favourite days of the entire program. Earlier we went to the Historial De La Grande Guerre in Peronne. It was a very interesting and eye-opening experience. The museum focused on the First World War and had artifacts that shed light not only on the political issues of the time, and important events of the war, but also on the varying perspectives and artistic perceptions of the war. After we explored the exhibits, we went to a hands-on workshop. One of our chaperones, Julia, led a workshop for us to be able to examine artifacts up close, which was amazing and something I would have never expected to do ever in my life. Also, today I had felt that I was beginning to become closer to the friends I have made over the course of the program. We spent a lot of time talking and we had a few laughs. Today, I also felt was a great leap in the analytical side of the program; we discussed lots of historical view points and I felt like we all earned a lot from those discussions. Lors de notre visite au mémorial de Thiepval, nous avons vues plusieurs soldats inconnus. Ces pierres tombales étaient marqués comme étant « A Soldier of the Great War» et puis en bas de cela, il y avait toujours (sauf quelques exceptions rares) une croix avec l’épitaphe « Known unto God ». À Thiepval il y avait plusieurs de ces pierres tombales donc je viens de décrire et alors pour nous encourager à penser d’une manière critique, après la tournée nous avons discutés à propos de la question : Est-ce que la croix aura dû être gravé sur la pierre tombale des soldats inconnus sans savoir leur religion? À mon avis, il sera mieux de ne pas mettre de croix. J’explique que pour ceux qui croient dans la religion catholique, leur croyance et entré au paradis n’est pas déterminé par si la croix est présente sur leur pierre tombale ou non. Essentiellement, le soldat est mort avec leur religion et rien ne changera cela même si leur pierre tombale n’a pas de croix gravée dessus. Toutefois, pour ceux qui ne croient pas dans une religion et qui sont misent une croix sur leur pierre tombale, ceci sera un grand manque de respect et imposera donc une fausse représentation de leur religion. En tout, on meurt avec nos croyances et alors rien dans la vie matérielle ne changera cela. Même pas une croix. The sun highlighted the caribou’s bronze antlers, as it stood looking proudly over the fields of Beaumont Hamel. The strong- almost majestic- figure represents the Newfoundlanders’ strength, resilience, and bravery as they marched into the line of fire raining down upon them. Visiting the Beaumont Hamel Memorial, we had the opportunity to take a guided tour through preserved trenches, see where the lines of troops would have stood, visit the cemeteries, and marvel at “Charlie”- otherwise known as “Boo” – the caribou to honour the bloodshed and sacrifice of the Newfoundland Regiment in the Battle of the Somme. At dawn of July 1st 1916, the Newfoundlanders fought valiantly during the British attack on the Somme. It was incredibly bloody and the regiment suffered 648 casualties; 70 percent of their original force. The Beaumont Hamel Newfoundland Memorial distinctly pays homage to the Newfoundland regiment, because they were not a part of Canada during the First World War. Going through the memorial, I was shocked and in awe by how devastating this attack was on the Newfoundland force, and more by how resilient and brave they remained. 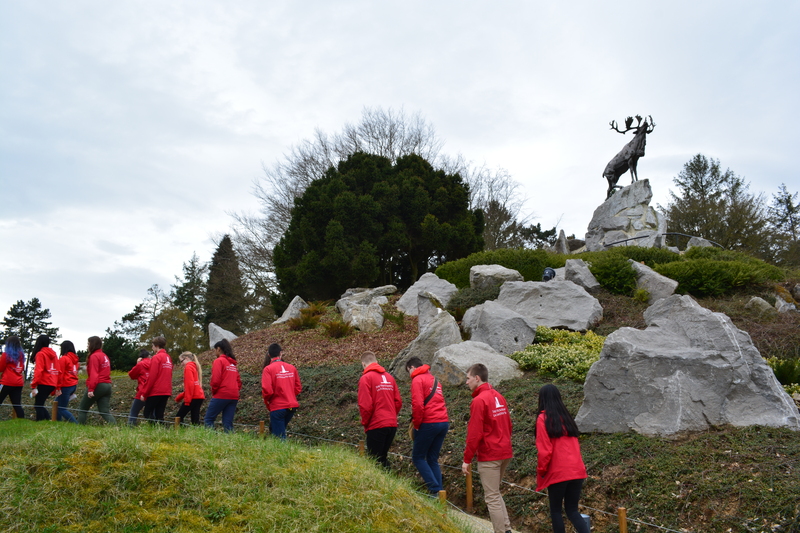 The combination of the beautiful statue, stories of the valiant Newfoundlanders, and sights of authentic battle zones made the Beaumont Hamel Newfoundland Memorial a very memorable, enjoyable, and educational part of the program.